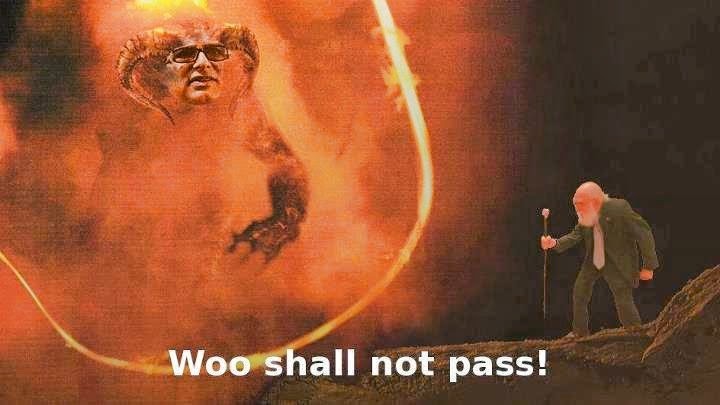 James Randi To Deepak Chopra: "Woo Shall Not Pass!" A few days ago, Deepak Chopra uploaded a video on YouTube wherein he sent a challenge to James Randi, Richard Dawkins and Michael Shermer. Having seen the video, I don't know exactly what the challenge is but you can go here and watch it yourself. Chopra is obviously trying to knock on the One Million Dollar Paranormal Challenge by the James Randi Educational Foundation. Many have tried to collect the JREF offer. All of them have failed. As to Chopra's challenge, Randi has responded, sort off. He posted the following photo on his official Facebook page. And it's amazing. Chopra's challenge is a BIG joke so it deserves to be made fun off. Photo from the James Randi Facebook page.